Much has changed in 20 years. Join us as we celebrate the nutrition profession's evolution in this in-depth review of its most significant developments. It's hard to believe Today's Dietitian turns 20 this month. Much has happened in the world of nutrition over the past two decades. A quick peek into the internet archive Wayback Machine reveals that one of the top nutrition tips 20 years ago offered at the fledgling ADA website (remember when our professional organization was called the ADA before it became the Academy of Nutrition and Dietetics?) was "with all the attention given to cutting fat, you're probably looking for easy ways to skim fat from your favorite recipes." The "tip for today from the ADA" on April 15, 1998, went on to suggest keeping plenty of fat-free condiments on hand to "slim down" eating for health. Dietitians in 1998 surely would have been shocked if they could see into the future that fat would be back with a vengeance and that the country would be in the throes of the high-fat keto diet phenomenon. Yes, the world of food and nutrition has evolved dramatically. Just think back to a time before social media was there to spread nutrition messages (both reliable and unreliable), when weight loss was all about calorie counting, and sustainability was an unfamiliar term. In honor of Today's Dietitian's 20th anniversary year, we take a deep look at some of the most significant changes in the food and nutrition world, and how dietitians can navigate these trends to help guide consumers toward better health. Today, consumers rely on the internet and social media, such as Instagram, Facebook, and Pinterest, to tell them nearly everything they need to know about what to eat. From blogs on nutrition and weight loss to images you pin on a board for dinner ideas and video "stories" on recommended food products, there's no shortage of information on food and nutrition floating around on screens. This change represents a dramatic shift. A survey from the Pew Research Center found that the number of US adults now using social media has grown significantly since 2012. The majority use Facebook (73%) and YouTube (68%), while 35% use Instagram, 29% use Pinterest, 27% use Snapchat, 25% use LinkedIn, 24% use Twitter, and 22% use WhatsApp. "Social media has become a key mode of communication, and that's no less true in the food and nutrition world," says Carrie Dennett, MPH, RDN, CD, Pacific Northwest–based owner of NutritionByCarrie.com. "Health-conscious consumers crave the next 'big thing' in nutrition news, and social media has an immediacy that is appealing. But beyond the sound bites served up by social media, certain platforms have become powerful ways to build community, both for dietitians who have blogs and those who don't. I see Facebook groups—whether public, private, or secret—as major ways of uniting dietitians with their ideal client groups, or like-minded dietitians with each other." "With the explosion of social media, RDNs have nearly limitless opportunities to influence what consumers purchase and cook," says Lauren Harris-Pincus, MS, RDN, author of The Protein-Packed Breakfast Club. "Photo applications in particular, such as Pinterest and Instagram, provide gorgeous images to entice people to search out the corresponding recipes. The introduction of short how-to or 'hands and pans' recipe videos show the steps to create a recipe at home with ease. While many available videos showcase very high-calorie foods that lack nutrient density, as RDNs we can create visually appealing options to intrigue consumers." Amid the cacophony of voices in social media, dietitians are rising above the noise and making a name for themselves. Scores of dietitians have award-winning blogs and social media communities with large followings, including Lindsay Livingston, RD, at The Lean Green Bean; Alex Caspero, MA, RD, at Delish Knowledge; and Sally Kuzemchack, MS, RD, of Real Mom Nutrition, to name just a few. "With algorithms on social media platforms like Facebook and Pinterest, dietitians have become increasingly creative as they compete for attention in the crowded online space," says Liz Weiss, MS, RDN, who runs the Liz's Healthy Table podcast and blog. "Some dietitians now have regular shows on Facebook, so consumers can watch, listen, interact, and learn on a regular basis. RDs have worked hard to improve their food photography, carve out their individual niche, and turn their personal experiences into teachable lessons." All of these opportunities to have a voice in social media come with an increasing responsibility to get it right. "In the hurry to respond quickly and 'be seen,' it's all too easy to share someone's comments about a study without taking time to actually review the study and consider whether it's worth sharing, and whether the description of it is accurate," says Karen Collins, MS, RDN, CDN, FAND, a consultant specializing in cancer prevention and heart health. "If we want to maintain our reputation as professionals people trust to translate science, we need to guard that position." Virginia-based Jill Weisenberger, MS, RDN, CDE, CHWC, FAND, author of Prediabetes: A Complete Guide, notes that dietitians' science-heavy education has prepared them well for the challenges in social media. "It's especially important for us to share accurate and relevant health information in an engaging and nonthreatening way," she says. Harris-Pincus believes myth busting and debunking pseudoscience prevalent on a daily basis in the media are important roles for RDs. "By explaining recent studies through blogging and social media, we can help to tame the hysteria that ensues when research is taken out of context," she says. While obesity had reared its head by 1998, the approach to losing weight was more formulaic. Weight Watchers, Nutrisystem, and Atkins were options the public embraced. Fast forward to today, and more people are avoiding the "d" (as in diet) word.4 The number of active dieters has fallen by 10% since 2015.5 This shift coincides with the "nondiet dietitian" trend emerging, which sees many RDs taking on a more holistic, body-positive view of weight management. "Increasingly, commercial weight loss programs are turning away from the words 'diet' and 'weight loss' in favor of 'wellness' and 'lifestyle.' This is also true among many dietitians who work with clients seeking weight loss," Dennett says. "This doesn't mean that people aren't dieting and aren't actively pursuing weight loss; it's just that the marketing has changed." Dennett sees another trend rising: the increasing use of mindful eating and intuitive eating as approaches to weight loss, which she views as unfortunate because these practices aren't about weight loss. While some people do lose weight when they learn to eat mindfully or intuitively, others do not, depending on their history of restrictive dieting and how actively they were working to push their weight below their body's defended range, Dennett says. She reports that many more dietitians are embracing mindful and intuitive eating in their nutrition counseling work as these practices were intended—to help clients tune into their body's internal cues for what, when, and how much to eat, and for growing awareness of how certain foods or combinations of foods make them feel. "I am so happy to see more dietitians talk about not shaming oneself and others," Weisenberger says. "I love that more RDNs are helping clients see their bodies as strong and valuable instead of disappointing or something to be ashamed of. But I disagree with the notion that we should stop helping clients lose weight. I have always supported a health-first attitude, but to deny that weight loss has value or [to say that it] typically causes harm is very worrisome to me." "Weight loss is always big business, and in the last several years we have seen polar opposite trends emerge with almost equal popularity," Harris-Pincus says. "On one end we see very restrictive diets eliminating whole food groups, like gluten-free, Paleo, Keto, and Whole30. On the other end are nondiet approaches, such as Health at Every Size (HAES) and intuitive eating, that discourage restrictions and focus on listening to your body to implement lifestyle changes. As with everything, there are some RDNs who gravitate toward one end or the other, each with some science to back up their perspectives. Ultimately, the key is assessing what is the best plan for each individual client." "Plant-based eating has certainly evolved into a major trend for several reasons. People are more environmentally conscious and becoming aware of how our food choices affect the planet," Harris-Pincus says. She believes plant-based eating historically was associated with vegetarians and vegans, but the rise of Meatless Monday and research on the benefits of plant-based eating has increased the desire for consumers to incorporate more plant-based foods without the need to completely eliminate animal products. Weisenberger adds that plant-based eating is getting a boost from research supporting all types of plant-based eating patterns, in addition to people who are interested in the microbiome. "The carbon footprint associated with raising animals vs plants has received a lot of attention, so when consumers hear about initiatives like the Meatless Monday movement, they're inspired to give meat-free meals a try," Weiss says, adding that in addition to the social pressure to eat less meat, there's also a growing world of interesting plant-based foods to choose from at supermarkets and restaurants, including beans, seeds, whole grains, legumes, and new and interesting vegetables. "Though plant-based diets used to get a bad rap for tasting bland and boring, now, thanks to food bloggers, cookbook authors, and chefs, meatless meals have become accessible, delicious, interesting, and doable for everyone." Dennett says, "More people are going meatless for at least some meals and showing interest in alternative sources of protein, whether that be pulses, tofu, and tempeh, or faux meats. I've observed more and more dietitians move into the plant-based space—also motivated by nutrition and environmental awareness—especially as they become active with blogging and social media. Just look at the colorful vegetable-forward photos on Instagram." Collins says, "Wording is proving an increasing challenge for dietitians, as there's growing use of 'plant-based diet' to refer to a vegan diet, whereas research and recommendations calling for a plant-based diet often simply mean making whole, nutrient-rich plant foods the largest part of the plate." For her part, Collins has started using terms such as "plant-focused" and "plant-forward" more frequently to be clear that she's discussing research that shows a variety of plant-slanted eating patterns are healthful. "I think the importance of sustainable food systems is something that more nutrition experts are becoming aware of—and concerned about," Dennett says. "The attempts of the Dietary Guidelines Advisory Committee to bring sustainability into the 2015–2020 Dietary Guidelines for Americans exemplifies this. If, as dietitians, we want the world to have enough nutritious food to eat, we have to care about how our food is produced. Educating clients and consumers about the benefits of eating more plant foods and fewer animal foods is a major way dietitians are getting involved, even if they choose not to be vocal about sustainable agriculture itself, although more dietitians are speaking up in that sphere." Indeed, there are numerous opinions on the definition of sustainability in the food and nutrition world. Dennett says, "We are witnessing more arguments—especially on social media—between dietitians who support organic agriculture and dietitians who support genetic engineering." While not all dietitians may agree on what sustainability looks like on the dinner plate, most agree that food waste prevention is something everyone can rally around. "When consumers hear that 40% of our food, from farm to fork, is wasted, they go a little nutty. Awareness about the issue of food waste has increased significantly over the past few years and RDs are talking about it. Food and nutrition bloggers, supermarket RDs, and [those in] academics aren't just discussing the problem; they're offering solutions," Weiss says. Would a dietitian entering the field of nutrition in the late '90s ever have predicted that the country would be obsessed with their guts and all of the teeming microorganisms that reside there? No wonder the supermarket case for fermented everything—sodas, vegetables, condiments, and beyond—is booming. "You know the microbiome has made it to the big time when a popular magazine like Cooking Light devotes an entire issue to the subject," Weiss says. "The gut microbiome is one of the hottest areas of nutrition research, with exciting implications for the future of personalized nutrition," Dennett says. "Just as we are learning more about how nutrition interacts with specific genetic polymorphisms, we are learning how nutrition shapes and interacts with the population of microbes in our gut." Dennett believes this is important for a couple of reasons: The gut microbiota is a likely intermediate in the path between a plant-based diet and better health, and, as we learn more about the gut-brain axis, eating to support a healthy gut microbiota has implications not only for physical health but also for mental health. Collins adds that evidence links the gut microbiome to chronic inflammation, which is tied to many noncommunicable diseases. "Dietitians are increasingly engaging with clients and consumers on the topic of gut health, whether it be educating them about increasing plant foods, incorporating fermented foods, or choosing an appropriate probiotic supplement," Dennett says. "RDs are making a microbiome-friendly diet doable and delicious, and they're taking the mystery out of the microbiome. RDs who specialize in digestive disorders, including conditions like IBS, are starting to work with the food industry, and consumers are looking for GI RDs to guide them toward foods that both feed and calm their gut," Weiss says. However, Weisenberger cautions, "It's important that we pay attention to the research, but I'm concerned that we don't know enough or have the research to make the types of recommendations that consumers want from us." "Dietitians can build trust by helping people avoid some of the ineffective, and sometimes dangerous, steps they might otherwise unknowingly take," Collins says. "Dietitians who advance their knowledge about this are uniquely qualified to show how evidence-based nutrition can support a healthy gut microbiota and work in other ways to support health." In the past, a dietitian primarily had to focus on nailing food and nutrition science, MNT, and foodservice management. Have the times changed since those quaint days? Over the past 20 years, RDs have been increasingly moving beyond those key skills to embrace additional specialty practice certifications, such as Certified Diabetes Educator, Certified Nutrition Support Clinician, and Certified Specialist in Sports Dietetics, as well as postgraduate education (which will soon be required) in a variety of degrees, including business administration and sustainable food systems. And they're not stopping there; they're acquiring nontraditional skills to maximize their success. "The most exciting skills RDNs are adding to their professional toolboxes include writing, blogging, video production, health coaching, and podcasting," says Harris-Pincus, noting that there are several podcasts that focus on niche areas, such as Melissa Joy Dobbins', MS, RDN, CDE, Sound Bites, and This Unmillennial Life, hosted by Regan Jones, RD. "I definitely see an increase in dietitians moving into nontraditional and entrepreneurial roles, whether it's a side gig to a more traditional job or as a total career switch," Dennett says. "Dietitians are developing virtual private practices, online programs, and membership sites. They don't even have to go it alone anymore, as some of the 'first wave' nontraditional dietitians are taking what they learned and have created their own niches, helping the next wave of dietitians navigate their own path." In addition, there are more dietitians working to increase their presence in the media, whether as a quoted expert source or as a content creator, Dennett says. "The increased importance of social media appears to be playing into this trend, as does the trend of nutrition entrepreneurship," she says. "Being in the media, in one form or another, is a valuable way of building a professional brand and opening doors to new revenue opportunities." Without a doubt, dietitians have seen many changes in the dietetics field over the last 20 years. The evolving trends in social media, weight management strategy, plant-based eating patterns, sustainability, and ongoing research on the gut microbiome's influence on various aspects of health will continue to fuel excitement in the field and inspire dietitians to stay abreast of the latest medical breakthroughs and discoveries. And with the uptick in nutrition-related chronic diseases such as type 2 diabetes, CVD, and nonalcoholic fatty liver disease, dietitians surely will need to be in tune with the latest research to better counsel patients. In another 20 years when RDs gather together to reflect on the top nutrition priorities, trends, and concerns in dietetics, what might we be talking about? Dietitians may be discussing these same issues, given the anticipated rise in the world population and chronic disease, as well as global temperatures. Yet, on the social media front, who knows what form of communication we'll be using by then? No matter the nutrition issue or trend, dietitians—who are increasingly viewed as key, respected health influencers by consumers and the media—will be right there along the way to help guide our clients, patients, and consumers at large. — Sharon Palmer, RDN, is The Plant-Powered Dietitian and nutrition editor of Today's Dietitian. 1. Smith A, Andersen M. Social media use in 2018. Pew Research Center website. http://www.pewinternet.org/2018/03/01/social-media-use-in-2018/. Published March 1, 2018. Accessed November 21, 2018. 2. Pinterest Audience Demographics. Pinterest website. https://business.pinterest.com/en-gb/audience-demographics-user-stats. Accessed November 21, 2018. 3. Most popular Pinterest categories in the United States as of February 2017. Statista website. https://www.statista.com/statistics/251048/most-popular-categories-browsed-on-pinterest/. Accessed November 21, 2018. 4. Snook KR, Hansen AR, Duke CH, Finch KC, Hackney AA, Zhang J. Change in percentages of adults with overweight or obesity trying to lose weight, 1988-2014. JAMA. 2017;317(9):971-973. 5. U.S. weight loss market worth $66 billion. PR News Wire website. https://www.prnewswire.com/news-releases/us-weight-loss-market-worth-66-billion-300573968.html. Published December 20, 2017. Accessed November 21, 2018. 6. MEGATREND: Plant-based eating: nearly seven of 10 Americans trying to increase plant protein consumption. Food Navigator website. https://www.foodnavigator-usa.com/News/Promotional-Features/MEGATREND-Plant-based-eating-Nearly-seven-of-10-Americans-trying-to-increase-plant-protein-consumption?source=3?utm_source=newsletter_daily&utm_medium=email&utm_campaign=GIN_FNUd&c=Jh%2B9P%2FDNbaj6IUwHpM8ILWbQdQMzG%2FlV&p2=. Updated November 19, 2018. Accessed November 21, 2018. 7. Meyer M. One-third of Americans are dieting, including one in 10 who fast … while consumers also hunger for organic, "natural" and sustainable. International Food Information Council Foundation website. https://www.foodinsight.org/2018-food-health-press-release-diets-organic-natural-sustainable-trending. Published May 16, 2018. Accessed November 21, 2018. 8. Tagtow A, Robien K, Bergquist E, et al. Academy of Nutrition and Dietetics: standards of professional performance for registered dietitian nutritionists (competent, proficient, and expert) in sustainable, resilient, and healthy food and water systems. J Acad Nutr Diet. 2014;114(3):475-488. 9. Global probiotics market will reach usd 65.87 billion by 2024. Zion Market Research website. https://globenewswire.com/news-release/2018/06/21/1527822/0/en/Global-Probiotics-Market-Will-Reach-USD-65-87-Billion-by-2024-Zion-Market-Research.html. Published June 21, 2018. Accessed November 21, 2018. 10. Elder M. World markets for fermentation ingredients. BCC Research website. https://www.bccresearch.com/market-research/food-and-beverage/world-markets-for-fermentation-ingredients-fod020e.html. Published February 2018. Accessed November 21, 2018. Here's a brief synopsis of the achievements that have us bursting with pride. Today's Dietitian's RD Lounge, a blog for and by RDs established in 2016, garners 6,700 monthly views. 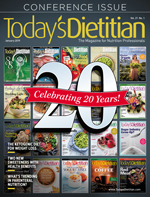 TD10, an annual feature article showcasing 10 dedicated dietitians who are selected based on nominations by their peers, first appeared in the magazine in 2010. The winners are announced during National Nutrition Month. Today's Dietitian Spring Symposium, founded in 2014, attracted 300 attendees and 10 presenters to its initial gathering. The 2018 event was attended by more than 700 professionals and featured 27 presenters. Today's Dietitian's social community has achieved steady growth on all platforms, with 75,000 people currently following the magazine on Facebook and another 40,000 on Twitter. Conducted by Pollock Communications and Today's Dietitian, the What's Trending in Nutrition Survey tracks emerging developments in the industry by polling dietitians. Founded in 2014, the survey received nearly 871 million media impressions in 2018. Today's Dietitian's CE Learning Library, established in 2012, boasts an impressive 68,000 users.